lack is the keynote here, variously interpreted in the steel case subjected to an ultraresistant carbon-based treatment; the unidirectional rotating bezel; the large screw-locked crown and non-slip pushpieces; and on the dial base creating a striking backdrop for the white luminescent hands, hour markers and red-rimmed counters. Its original, technical and powerful appearance makes the Avenger Seawolf Chrono Blacksteel limited edition an unmistakable standout model among diver's watches. But its greatest feat is hidden inside its case, thanks to its magnetic pushpiece system. 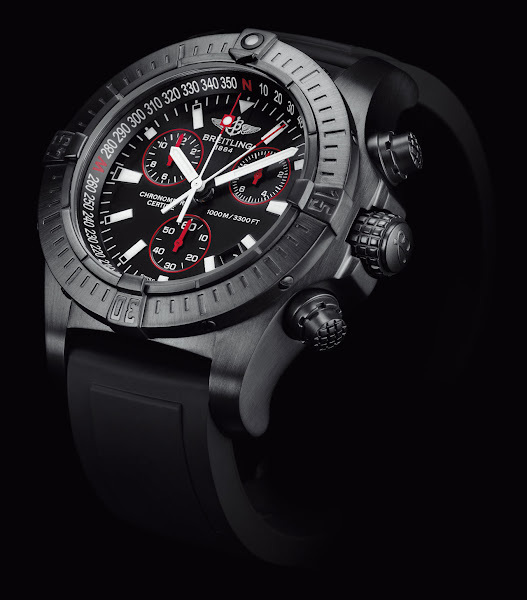 This exclusive Breitling patented device serves to activate the controls through the metal of the case, without any direct mechanical contact. This means that whereas most chronographs cannot be used when diving, the Avenger Seawolf Chrono is the only instrument of this type to be watertight and fully operational at a record depth of 1,000 meters (3,300 ft). To accompany professionals to great depths in complete security, this extreme chronograph has been equipped with a decompression valve and a glareproofed sapphire crystalguaranteeing optimal readability in all circumstances. 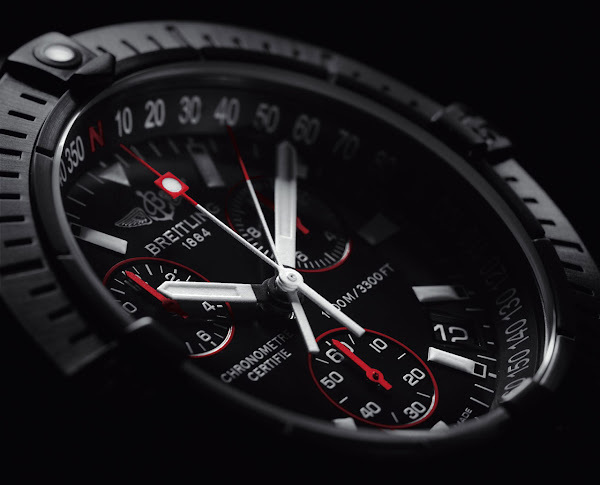 Its SuperQuartz™ caliber – also exclusive to Breitling – ensures a level of accuracy ten times superior to that of standard quartz movements, enabling it to measure times to within 1/10th of a second complete with split-time indications. The Avenger Seawolf Chrono Blacksteel, issued in a 2,000-piece worldwide limited edition, is available on a – naturally black – Diver Pro rubber strap or on a perforated Ocean Racer strap. In a nod to Breitling's special ties with aviation, its inner bezel ring is adorned with a windrose serving to memorize a course – both underwater or in the air. Movement: Breitling Caliber 73, thermocompensated SuperQuartzTM movement, officially chronometer-certified by the COSC. 1/10th of a second chronograph, 60-minute and 12-hour totalizers with split times (split-second hand). Calendar. Case: black steel, limited series of 2,000. Water-resistant to 1,000 meters (3,300 ft) with functional pushpieces. Screw-locked crown. Unidirectional ratcheted rotating bezel. Cambered sapphire crystal, glareproofed on both sides. Diameter 45.40 mm. Dial: Volcano black. Straps: Diver Pro or Ocean Racer.